You want a holiday to Russia? Russia has many beautiful and amazing sights. Not only the landmark tourist attractions but also the natural attractions are the very perfect beauty. Russia is one of the countries with the widest size in the world, so it's no wonder if there are so many beautiful natural attractions in Russia that are obligatory to visit. 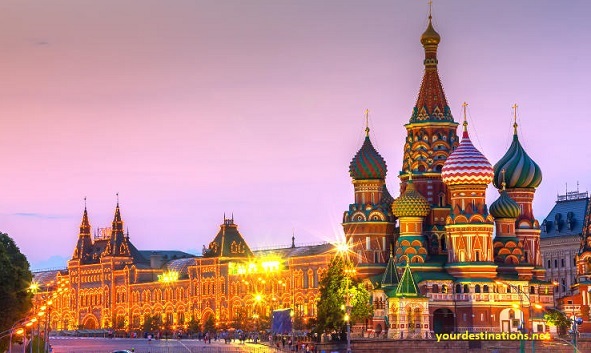 Want to know what are the attractions in Russia that must be visited? Read more below. The Kamchatka Peninsula is one of the most interesting and unique tourist attractions in Russia for you to visit. Until now there are many versions of the origin of the name Kamchatka. Of the approximately 20 versions of origin, there is one version of the most trusted which mentions that the name comes from the name of the river that flows through its territory. In addition, the main attraction of this tourist spot in Russia is the existence of a volcano. There are at least about 300 volcanoes and to date there are approximately 30 volcanoes that are still in active state. For those of you who love challenging sports and leisure, Volga River and Lena River are the tourist attractions in Russia that are suitable for you because besides being able to play kayaking, this tourist place is also equipped with unparalleled natural beauty. The Volga River is in an area close to the small settlement of Volgoverkhovy, while the Lena River is a river that comes from the slopes of the Baikal mountains. In this area, there are also many bends and mountains that are split in two by the river. This is the main attraction of tourist attractions in Russia this one so many tourists who want to visit. The Volga River is also touted as one of the largest rivers in Russia, while the Lena River is one of the rivers with the swiftest streams of water in the world. The Altai Mountains have long been the only link between Siberia and Mongolia. Because it is a place to connect 2 regions, many say his name to Altai. Some experts also find plenty of evidence of the life of the ancient people who once lived here. Some relics were found among others stone sculptures, paintings, and many others. One of the most famous places in the region is known as Ulalinskaya which is at least inhabited by the ancient people 1.5 million years ago. Red Square is one of the most interesting and famous tourist attractions in Russia. Located in the Russian capital, Moscow, this region is the most visited tourist attraction in Russia from travelers from all over the world. This area is also one of the city centers which is always crowded. This is not just because this place is in Moscow, but because of the wonderful buildings that are phenomenal here. In tourist attractions open to the public every day except on holidays and big events you can spend a lot of time to take pictures because there are so many interesting photo spots that you can use. Red Square itself since 1990 has become part of World Cultural Heritage. One of the most majestic museums in Russia and has many historical collections about the Romanov empire is the Hermitage Museum. Museum decorated with gold-colored pillars was founded by Katherine in 1764. When you enter this area, you will feel at the time of the Romanov Empire, because in this museum there are many historic collections, ranging from the collection of paintings to the legacy of the Romanov residence. As the name implies, this Tulip lala mosque is built with a dome that looks almost like a tulip flower that is in the process of expansion. The third largest mosque in Russia has a building similar to a famous building in Australia, the Sydney Opera House, plus an interior equipped with materials and goods of very high quality. The atmosphere of tourist attractions in Russia this one is very cool and comfortable because overgrown with a number of trees that become beautiful and comfortable. If you look at the history, tourist attractions in Russia was originally a fortress that serves to withstand the enemy type wartime attack. However, along with the times, the Kremlin fortress which has 20 towers was eventually used as one of the central government and also became the office of the President of Russia. In addition to the center of government, within the Kremlin complex there are also many office buildings, cathedrals, until the Diamond Fund Exhibition which is a place to store diamonds with a size of about 190 carats. To reinforce its historical value, the Kremlin also has one of the warehouses that serve to store many kinds of heritage, clothing, and horse-drawn carriages coming from the Emperor of Russia. Perhaps you have often heard of a tourist attraction in Russia called Mount Elburs? Located in a row of Caucasus, Southern Russia, this mountain has a height of approximately 5.642mdpl. This mountain is also included in the category of a mountain with the highest peak in the World. Therefore, if you have a hobby of doing hiking, Mount Elbrus is the right choice. One of the people who had reached the summit of Mount Elbrus was Florence Crauford Grove who was the leader of the first expedition of Mount Elbrus in 1874. For climbing activities on this mountain, it is advisable to do together with people who are professional because, in addition to having a steep path, extreme weather changes suddenly at the top of the mountain. The good news, Mount Elbrus is equipped with a cable car that will help the climbers up to start climbing from a height of 3.800mdpl. Russia also has a very historic katerdral which has now turned the function of a religious museum and is known by the name of St.Sophia Cathedral. One of the uniqueness of tourist attractions in Russia is the interior architecture that combines between Islamic culture in one corner of the room. Here you will also find a wall with the writings of Allah and the Prophet Muhammad. In addition, a very unique crystal lamp ornament and a very well preserved marble floor also make the building that has 3 luxurious gates looks more elegant. Not only that, this cathedral also has a dome with a height of 125 feet and is considered one of the oldest churches in Russia. Well, that's a list of recommended tourist attractions in Russia from yourdestinations.net . Which tourist places in Russia would you like to visit? Share yuk!